An unforgettable Christmas is carefully built from love, compassion and giving. Since the Christmas countdown has already started, we here at Freshome comprised a collection of 30 modern Christmas decor ideas for delightful winter holidays to inspire you. You already know what you wish this Christmas would feel like, so go ahead and get inspired from our list of modern festive room designs, fireplace decorations, Christmas trees and all those holiday arrangements for the perfect family Christmas dinner. Make Your Own Joy and Share It! All you have to bring to the table is happiness, an open heart and someone to share these uplifting feelings with. From monochromatic Christmas decor to vividly colored holiday decorations, we cover a wide array of possibilities to take into account this holiday season. Joy to the world! White, Grey, Black – for Christmas? 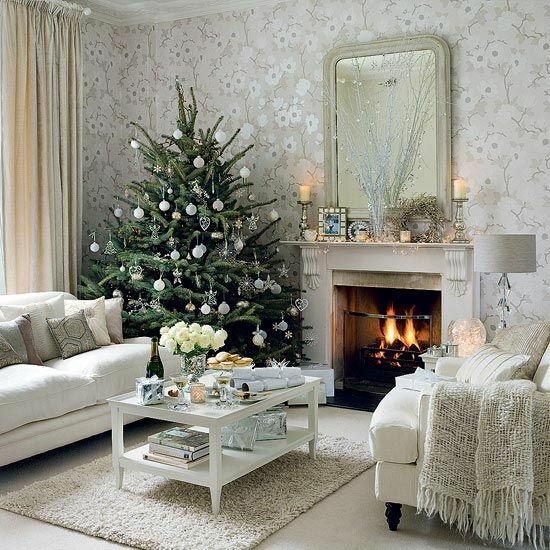 Modern Christmas decor in white and grey guarantees the Christmas tree gets all the attention. Imagine a home decorated with graceful details enhancing the power of Christmas home decor. Furry textures add depth and warmth, balancing the austere color palette so the green Christmas tree looks vivid and everlasting. Silver and candlelight complete the luxurious scene, making every moment count even more than before. A frosted decor livened with blue tones can really make a difference this Christmas. Take it from the designers of the space above – a living room decorated for Christmas revealing nautical inspiration. Last-minute decorating should be easy if you stick to the colors already present in the room and know how to arrange your room around your Christmas tree. Adding some starfish and jellyfish tree decorations and hanging coastal-inspired stockings on the fireplace mantel is just what you need to create a feeling of a coastal Christmas. We’ve shared 10 Ways to Enjoy an Eco-Friendly Christmas, so this year inspiration can go deeper than color, texture and aromas. Try to mix and match prints into your holiday decor, as shown above. An invitation to reading and writing, to opening paper-wrapped gifts and cuddle with the teddybear by the fire, this refreshing living room gives Christmas a lively appeal. An elegant and graceful living room doesn’t need to be overcrowded with Christmas decorations. Sticking to the Christmas tree, a natural mantel decoration and some decorative trees here and there should do it if you have a carefully articulated interior design. The fire will warm up the atmosphere and Christmas carols will be heard from the piano – all in an uncluttered, welcoming space by Munger Interiors. Christmas with a fireplace seems an idea descended from perfect Christmas fairy tales, where magic reigns. This elegant living room seen in a snowy-white home in Norway can inspire you to re-create the aesthetic of magic you remember from Christmas stories heard as a child. A white room can be decorated with white and gold accents and adorned with some vintage pieces that tie the decor to the past. Using delicate tulle to decorate the Christmas tree, stars and candle light, try to re-create the feeling of a magical Christmas with Nordic inspiration. Tall living rooms make for a fabulous Christmas atmosphere. Imagine a tall Christmas tree reaching alongside vertical windows to create a glamorous feel and presents gathered at its base. Sparkles and natural light mix to create a picture-perfect background for family photos. Indulge in creating your own dream Christmas decor, just remember that simplicity makes for a modern Christmas. Choose from these 10 Christmas tree ideas if your home is not tall enough to displays a towering tree and make way for the holiday spirit! A Scandinavian-inspired Christmas at home could be of a minimalist choice this year. Inspired by Nordic design, this house overlooking the Oslo fjord shows how furry textures, wood, fire and light mix in an inspiring Christmas setting. Modern Christmas decor relies on Scandinavian design to reduce the amount of color and induce coziness. And if you want even more inspiration, you should also check out these 30 Christmas decorating ideas to get your home ready for the holidays. A modern Christmas can mean showcasing exotic decorations, like the example above displays lemons and oranges among pine cones and winter greenery. Tropical fruit makes an interesting statement when last-minute decorating and creativity come together in an interior by Tobi Fairley Interior Design. Not your usual holiday decoration choice, lemons and oranges can break the monotony of traditional Christmas decor and show us we still have much to learn from nature. A living room decorated for Christmas has the power to transpose you into a reality where family takes central stage. The holiday season turns your home into a glowing, glittering dreamland where gifts await un-wrapping under the tree and everyone joins in on Christmas carols. Festive tartan plaid and glittery “snow” makes this home blend tradition with modernity thanks to Ballard Designs. Imagined by Lisa Gabrielson Design, this Christmas family room in burlap and blue tones belongs to a farmhouse where magical Christmases are waiting to happen. Flanking the decorated fireplace, antique bookshelves add depth to the fairy-tale space awaiting the family to get together for those magical Christmas moments. How do you imagine your dream Christmas? Decorating with a theme in mind can make your Christmas magical. The space above gives off a wood-inspired vibe. The crackling fire bounces light in the room decorated with abundant greenery and plush polar bears in a bunch. This fabulous home above was decorated with care and every room has its own Christmas vibe. You can enjoy your fireplace safely this holiday season if you know a few tips & tricks. We all know a crackling fireplace makes all the difference during cold winter evenings. Adding feathers and a Christmas wreath decorated with lights gives the whole room a wild, fairy-tale like vibe. Choose the things you love and make sure they enhance the beauty of the space and not clutter it, like interior designer Christopher Todd did with the space presented above. Imagine your Christmas dinner at home surrounded by loved ones and enjoying a carefully constructed atmosphere where vivid and neutral colors blend in an inspiring setting. This family home was prepared for the parents and their three children, gathering silver, gold and amber tones in a decor compensating for the present neutral colors. Christmas decorating ideas for a fancy living room can be found in many spaces. When your home is a cozy place, decorations can bring it to life. Under curved ceilings, the Christmas tree dotted with birdhouses promises a forest and freedom-inspired collection of holidays for you to enjoy. Elegantly styled for Christmas, this living room above offers a bright, welcoming and cozy place to get together with family for the holidays. Details construct the space and the scarcity of Christmas decorations give off a relaxing vibe. This setting can inspire you to focus on family and the Christmas dinner instead of being bombarded with bright lights and visually burdened with Christmas decor gathered in years. De-clutter your home and memories by keeping totems of what you loved as you grew up and make them family heirloom. Placed in a windowed corner of a room, a tall and slim Christmas tree can create a welcoming atmosphere not only inside, where it’s warm and cozy, but also outside. Seen from the window, a glittering Christmas tree replicating the heart-themed decor inspires love and warmth and extends an invitation to be inspired. In a traditional living room with arched windows like the one by Tobi Fairley Interior Design, Christmas is easily brought through colors and wrapped gifts. Vivid tones were added to create a cheerful atmosphere. The focal point is clearly the colorful mantel centerpiece with fun-sized ornaments that reduces the need for further decorating. Simple and powerful. If the space feels too empty, you can choose to go with original Christmas decals to liven up the place. The example above guides our inspiration towards animals and their wild purity. A picture of a beautiful white horse above the fireplace hints to coldness and warmth at the same time and replaces any mantelpiece decoration. This way, the snowed Christmas tree receives well-deserved attention. Decorating with gold for Christmas is like initiating yourself into a luxuriously laid-back world, where Christmas is just a Carol away. The space beautifully unraveling above inspires you to use flowers in both natural form on the mantel and flower-shaped snowflakes punctuating the Christmas tree. Mosaic floors and wooden walls impose a sober, masculine atmosphere. Flowers and a gold/silver mix ensure the feminine side balances the welcoming space. The living room with a well-equipped classic library and a fireplace is the perfect place to enjoy Christmas with family and friends. Imagine telling your grandchildren about Christmases spent in a fairy-tale room, where the fire gently accompanied sizzling conversations until morning. Bright lights help create a magical atmosphere by decorating the fireplace mantel, Christmas wreath and beautiful wooden beams in this traditional living room imagined by Teakwood Builders Inc.
We find ourselves faced with another Christmas inspiration including plaid patterns – this time mirrored in a pair of armchairs in front of the fireplace. Lit by the Christmas tree’s almost overwhelming lights, the holiday-spirited interior decor with wood walls invites to opening gifts and taking trips down memory lane over a cup of perfumed hot chocolate. Wild patterns bring that coveted sense of danger inside. Animal prints and pictures of animals immediately change a room’s vibe. There are a few design lessons we can learn from nature to feel good inside and around the home, to grow and constantly evolve. Merry Christmases with family and pets make the joy exponentially rise. So around the warming fireplace, a spacious couch gathers the whole family for an unforgettable Christmas. Make sure family photos find their space on the furniture to remind you that this year’s Christmas photo will be once again, one to proudly display. Mood-enhancing lighting creates the desired atmosphere and is successfully used during the holidays. Natural light can be guided using mirrors and the living room shown above proves that the elegant Christmas tree decorating it was the perfect choice. Inviting and cozy, this eclectic living space welcomes Christmas with an open nature. A comfortable, plush Christmas decor can be achieved by choosing crocheted or knitted furnishings and further warming up the space with candle light and fireplace flames. Fluffy and cozy, this monochromatic living room dressed in wood is a dream setting for any Christmas story. Imagined by The Gudhouse Company, this stylish living room in dark and light brown hues was decorated with blue accents. These simple decorations effectively make the ambiance hint to cold winter days. Tucked away from cold weather, nicely nestled by the fireplace, you can enjoy the glittery coastal-inspired starfish tree decorations. Everyone needs a moment to admire the decorations that will make this Christmas special. Vintage furniture pieces seem to be asking to be associated with Christmas decor. Stockings can be hung on the stair’s railway to deepen the feeling of Christmas, while winter greenery will be a simple yet effective way to bring the outdoors in this Christmas. As long as you know these 10 color basics everyone should know, you will have an amazing time decorating your home this Christmas. Details make the Christmas decor complete, so don’t forget to decorate stairs – they’re the perfect link to upstairs decorating, a seamless connection to a private enjoyment of Christmas decor. Knowing why to choose neutral colors when decorating your home could give you useful insight into an aesthetically pleasing Christmas design. Our final example of a beautifully decorated room for Christmas is one often forgotten: the bedroom. A cozy white bed with furry pillows and dotted with bright red pillow covers next to a small Christmas tree will have you dreaming about Christmas stories you know since you were a child. Now that’s a great way to give a present to the child inside you. Go get even more inspired with our list of 33 Christmas Decorations Ideas Bringing The Christmas Spirit into Your Living Room and let us know what you hope your Christmas will be like. And then maybe take a look at these amazing 18 Christmas dinner table decoration ideas to get you started on a Christmas dinner your family and friends will never forget.